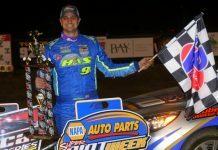 MIDDLETOWN, N.Y. – Matt Sheppard has a long resume of victories in his dirt Modified career. 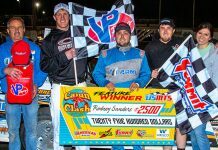 Sheppard collected his first victory at the Legendary House of Power in the Escape RV Inc. Hard Clay Open, the season opener of the Bob Hilbert Sportswear Short Track Super Series Fueled By Sunoco Halmar Int’l North Region. Sheppard collected $11,919 from the posted $47,219 payout plus $100 from Rob Sherlock Roofing for winning his heat race, $150 as a Precision Hydraulic & Oil Halfway Cash Dash winner and $200 from Superior Remodeling as the Halfway Leader for a total of $12,369 for 50 laps. A field of 60 STSS modifieds rolled through the gates in hopes of kicking off the 100th anniversary of OCFS in Victory Lane. The car count was the highest in the six-year history of the Hard Clay Open springtime event. 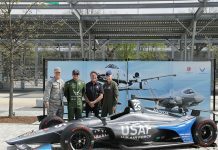 A large crowd took in the action from both sides of the five-eighths-mile oval. Friesen’s Halmar Int’l No. 44 had clawed his way into the top-five and caught the battle up front. 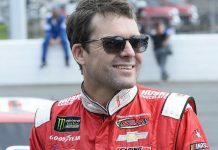 He along with, Perrego, Varin, Brett Hearn, and Mat Williamson fought for the runner-up spot until a yellow came out on lap 31. 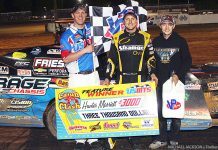 Friesen earned $5,000 as the race’s runner-up plus $400 from Rock Fantasy Concert Shop in Middletown, N.Y., as the race’s Hard Charger for his 18-position ascent. Perrego placed third in the Superior Remodeling No. 44 ($4,000), followed by Brett Hearn, who survived a 360-degree spin in turn one to place fourth ($2,600 including heat win money) and Mike Gular, who drove forward from 16th to finish fifth in the Terry Fasnacht-owned No. 2A ($1,800). Grant Hilfiger rim-rode to victory in the accompanying 20-lap Crate 602 Sportsman feature. Hilfiger powered past longtime OCFS competitor Jimmy Johnson in the final laps to take home a $1,000 top prize. Matt Sheppard, Stewart Friesen, Anthony Perrego, Brett Hearn, Mike Gular, Mike Mahaney, Brian Krummel, Danny Johnson, Andy Bachetti, Billy Decker, Jimmy Horton, Danny Creeden, Chris Whitehead, Mat Williamson, Allison Ricci, Ryan Watt, Tommy Meier, Brian Gleason, Craig Hanson, Brett Tonkin, Danny Varin, Tyler Dippel, Brandon Grosso, Jeremy Smith, Willy Decker, Rick Laubach, Tyler Boniface, Jerry Higbie, Billy Pauch Jr., Matt Janiak.